An Bord Pleanala (APB) has rejected plans for the controversial pedestrianisation of the College Green plaza in front of Trinity College. The planning authority announced that they would be refusing permission for the move, citing traffic concerns and the impact that removing buses from Dame Street would have on the city as a whole. In their decision, ABP said that “the proposed development would give rise to significant adverse impacts on pedestrians and on bus transport within the city centre and would, therefore, be contrary to the proper planning and sustainable development of the area”. In their determination, ABP also said that there was concern that footpaths on the Quays – where bus routes would have been rerouted – wouldn’t “have the capacity to accommodate the in-creased numbers of pedestrians that would be redirected onto the Quays”. The original plans for the project were initially introduced in 2016 and have been a point of contention for many who feared the pedestrianisation would impact on businesses. However, the plans were supported by cyclists and pedestrians campaigning for safer transport routes. Fianna Fáil Spokesperson on Transport, Robert Troy TD, said: “Part of the reason why, I believe, that An Bord Pleanála refused permission stems from the Government’s utter failure to address the ongoing traffic issues in Dublin City Centre. “Chronic traffic jams in and around the College Green and along the city’s quays added to this rejection. An Bord Pleanála repeatedly pointed out the ‘unresolved capacity issues’ in these core zones of the city. Sinn Fein’s Mary Lou McDonald said the refusal of the plans was ‘welcomed’. 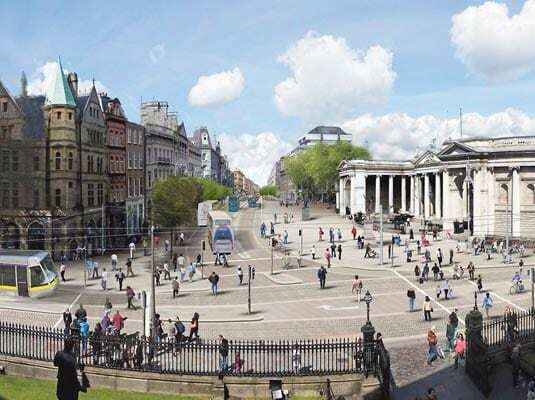 Deputy McDonald said: “The plans to pedestrianise College Green were not feasible and they failed to address the real impact to traffic, particularly for buses and taxi drivers. “There has already been ongoing disruption in Dublin since the Luas Cross-City was introduced in December.